The Sidecar is one of the best cocktails of all time. It remains as popular today as it was a century ago and it is a perfect introduction to what a truly great sour drink can be. The recipe was originally made with either cognac or Armagnac and either brandy makes a great cocktail. In recent years, it is has become common practice to make it with bourbon (creating a Bourbon Sidecar) and some even make it with cherry brandy. Whichever base liquor you choose for your Sidecar, do be careful with the other ingredients. It is very important to find the balance between sweet and sour and too much lemon or liqueur can quickly destroy the intended flavor. A classic addition to the Sidecar, which was mentioned in recipes from the early 1930's, was to rim the glass with sugar. This is a nice contrast to the sour drink. If you would like to make this cocktail just a touch sweeter, try using the Spanish brandy de Jerez. 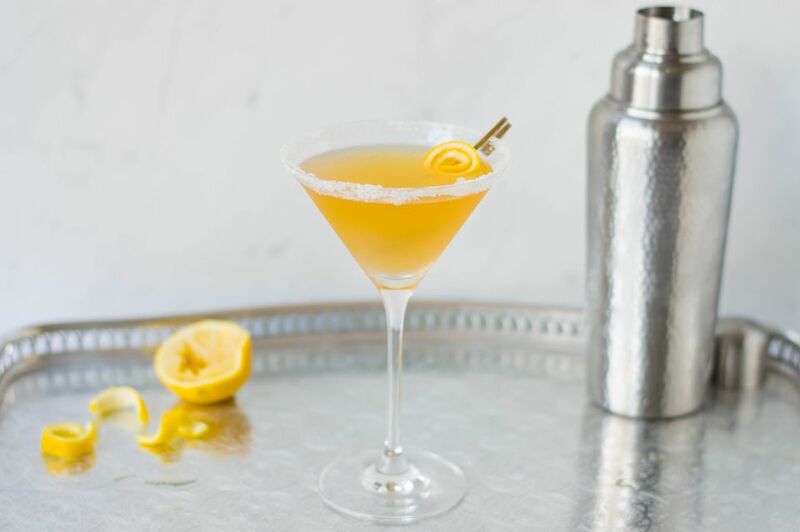 The Sidecar has influenced many other cocktails and some are classics as well. Others are new creations and play off the popular sour base, like: Balalaika (vodka instead of brandy), Blackberry Sidecar, Boston Sidecar, Chelsea Sidecar (aka Delilah or White Lady), Épicé Sidecar, Pisco Sidecar, and Pisco Sidecar. As most origins of cocktails go, there are a few different stories about how the Sidecar came into being. One story, as told by David Embury in "The Fine Art of Mixing Drinks" (1948), says that it was developed in a Parisian bistro during World War I by a friend who rode up to a favorite bar in a motorcycle's sidecar. Which bar this was is left to speculation, but it is popularly thought to be Harry's New York Bar. Another claim to the Sidecar invention attributes Frank Meier who worked at the Paris Ritz Hotel. As Gary "Gaz" Regan pointed out in "The Joy of Mixology," this was later disputed by a man named Bertin who worked at the Ritz after Meier. The next story moves to Buck's Club in London, the supposed home of the French 75 as well. In his 1922 book, Harry's ABC of Mixing Cocktails, Harry MacElhone credits the drink to Pat MacGarry, one of the great bartenders of the day. This was backed up in Robert Vermeire's 1922 Cocktails and How to Mix Them. It should also be noted that MacElhone owned Harry's New York Bar and that he also credits Buck's Club for the French 75 in his book. While he was a popular bartender of the day, he was also very honest (it seems, anyway) and did not take credit himself for the drinks he's often credited with. Which theory is correct will remain a matter of debate and opinion. One thing that is agreed upon is that the Sidecar is a classic sour drink. Sours were quite popular during the golden age of cocktails in the early 1900's and were a simple mix of base spirit, sour (primarily lemon) and a touch of sweetness. Other great sour drinks came about at the same time. Among the greats are the Brandy Daisy, the Whiskey Sour, and the Margarita. How Strong is the Sidecar? Short drinks like the sidecar are served ​'short' because they pack a punch. They are made mostly of liquor and it's only natural to keep these potent drinks nice and small. With an 80-proof base liquor, the average sidecar weighs in right around 26 percent ABV (52 proof). This is in line with similar drinks like the martini and Manhattan.